1. What made you decide to start the acting studio? I had moved to LA from New York a few years earlier and tried to find a master class for people who had trained in a full 2 year “New York style” Meisner training program. After auditing a number of schools in town, I just didn’t find what I was looking for. I was teaching at another studio – and realized that if I wanted that – I was going to have to build it from the ground up. Some former students of mine encouraged me to start something on my own – with about 12 of them committing to the 2 year Meisner Technique syllabus. That was back in 2001. We started with one group meeting twice a week, just me, renting out a theatre space – and gradually we grew to where we are now, with our own studio, 9 classes a week, and 5 instructors. 2. What do you believe are the key advantages of the Meisner technique, when compared to other techniques of acting? It’s all about working from impulse rather than intellect. Every part of the exercises is geared to keep the actor working from their instinctual self. Because it’s improv based – the actors are required to really stretch their imaginations – and that is invaluable because the imagination is limitless. Some other techniques tether you to your own life’s experiences – which is really quite limiting. Meisner asks that you keep expanding your connection to the imagination. Also, it is a building block technique. What that means is that each step builds upon the prior step. So if you do step a, then step b, then step c you will end up at d. It gives the actor a reliable process that they can do EVERY time. It gives them a craft – and that is so much better than throwing the mud up against the wall to see what sticks. 3. What are some of the attributes that make for great acting students? Fearlessness, empathy, discipline, curiosity, a vivid imagination, a desire to have their voice heard, and a strong and supple instrument that allows for all that to be revealed in the character. 4. What are some of the most difficult challenges your students face, and how do they overcome them? Tension is always a big issue, it is what blocks a student from their impulse. It keeps them from having a free voice and physicality. It prevents them connecting emotionally to their partners or the circumstances of the scene. Often times students don’t even realize they are tense. The tension has become such a habit it feels “normal”. The first thing we do to help them is make them aware of it. That’s half the battle – when they find themselves gripping, or holding their breath in certain moments they can release. WE also have a series of breathing and focus exercises that help.
. How are classes at your school different from classes in a traditional classroom? Well if you mean by traditional classroom something like your high school English class – well – this isn’t anything like that. Most of the work is done on our feet, up and moving around. Acting is a kinesthetic process – students have to feel it in their bodies – not just in their brains. We learn everything by doing. 6. What are some of the specific areas your courses focus on? We have 2 main branches of our actor training. Our professional program is based on The Meisner Technique as I was taught it by William Esper and Maggie Flanigan. That is a 2-year program where the classes meet twice a week. We discovered many years ago however that many people are interested in the acting process but don’t know enough about it to commit to something like our Meisner Program. That is why we developed our Basic Technique series. This offers 3 different 12 week sessions that meet once a week. It is a more traditional style of training, pulling from a variety of techniques. It exposes students to how actors develop characters, break down scripts, expand the imagination and develop an expressive instrument. 7. What are some common misconceptions people have about the acting profession? That you either have it or don’t. You need to have some basic talent for it – but it is a skill set that can be taught and developed. 8. 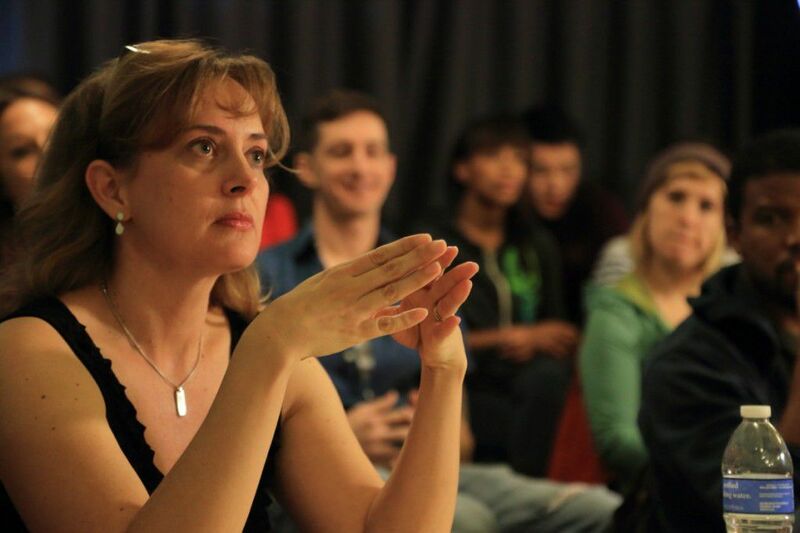 The acting studio has been running now for nearly fifteen years, and many of your classes fill up quickly. What do you believe are the key factors of the studio’s success? Quality control. We are a small studio, with small classes so that we can focus on the students individual needs. Our teachers are invested in each student. Because we only take 90 students we can focus our time and energy on classes rather than on marketing and advertising. 9. Can you think of any key thing (or things) you’ve learned since the studio first opened? That this craft is more important than ever. True connections between people is harder and harder these days. Our communication is now buffered by technology and our vulnerability is protected by a screen. Student actors come into class craving human connection on the deepest level. Movie and theatre goers ask the actors to experience these honest connections so that they can vicariously live through them. Actors are becoming society’s conduit to a fully felt and experienced life. It’s a huge and wondrous responsibility. For more information on classes, schedules, and our philosophy please check out the studio’s website. Improvisation is all about spontaneity, and existing within the moment. You have to work from the impulse rather than planning what will happen. Put simply, improv is about listening, acceptance, and authenticity. In improv comedy, it’s easy to find great examples these days of master improvisers. Steve Carrell, Will Ferrell, Sascha Baron Cohen, Amy Poehler, and Jim Carrey have each made their careers as comedic improvisers. Entire TV series have begun from improvised scripts like “The Office” , “Workaholics” , and “Parks and Recreation.” But improv isn’t just for comedy. Some the best improv masters are highly respected for their dramatic roles, including some of the greats: Robin Williams, Bill Murray, and Robert De Niro. Bill Murray actually began his career in improv as a young man in Chicago’s Second City improv comedy troupe. Later on he took his comedic talents to the National Lampoon Radio in New York City, which led him to be discovered and brought on to Saturday Night Live. Most famously, he created almost all of his own dialogue in the cult classic, “Caddyshack,” including the “Cinderella Story” bit in the film. He also improvised his entire Peter Venkman character for “Ghostbusters” and an entire scene of dialogue for the movie “Tootsie.” Now Murray has been acclaimed for his dramatic work as well, showing that the honesty he found in improv has given him great range. Robert De Niro was only 17 when he dropped out of high school and auditioned for Stella Adler’s Academy in New York. Most well known for his dramatic roles, De Niro is a fantastic example of incredible improv coupled with Meisner-style acting. The Meisner Technique is an improvisationaly based training which demands that the actor respond from their instincts rather than their intellect. He is most well known for his entirely improvised scene talking to himself in front of a mirror during “Taxi Driver.” He is also said to have improvised most of the script and dialogue ideas for “Goodfellas” with his fellow actors in rehearsal. Improvisational skills can improve any actor as it requires the actor to respond spontaneously in character. This spontaneity is a fundamental philosophy in acting- to be so deeply in character that your thoughts and actions are fluid and authentic. Even when adhering to a script, the best actors will use the impulses they have developed in improv to keep the scene spontaneous. While improv lends itself well to comedy, a true master can utilize improvisation in all types of roles and genres. At Elizabeth Mestnik’s Acting Studio, we strive to foster this spontaneity and engagement in our students.